PALM SPRINGS, Calif. ~ It’s been quite the MLB career for former Palm Springs POWER pitcher Aaron Brooks, filled with many call-ups and send-downs ever since he made his debut with the Kansas City Royals in 2014. 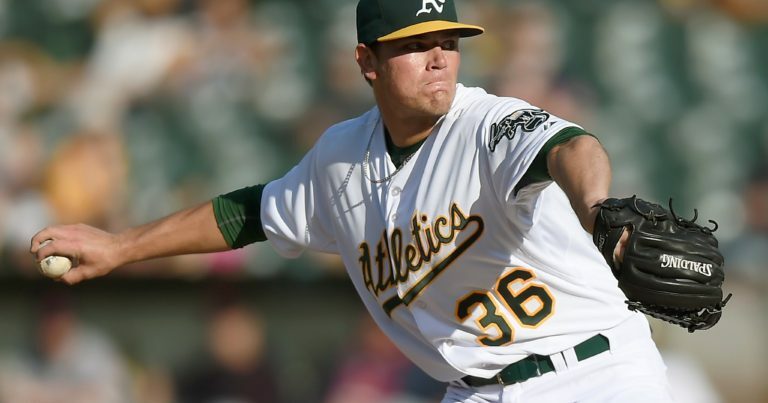 To start 2019 however, Brooks finds himself rounding out the back end of the Oakland Athletics rotation. Aaron spent his 2009 and 2010 summers here in Palm Springs and dominated his competition. In ’09 he tossed 56 1/3 innings with a sparkling 0.32 ERA, struck out 47 batters while only walking 3 and earned a 6-0 record while also notching a save. In 2010, Brooks threw 42 innings with a 1.50 ERA while striking out 43 and earning a 5-0 record. As the Athletics start their season with 18 consecutive games Brooks will look to capitalize on his opportunity to stick in the majors, hopefully this time for good. Click here for more on this story, written by Chris Haft.